Liguria is a coastal region of north-western Italy, the third smallest of the Italian regions. 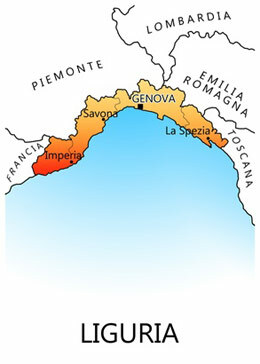 Its capital is Genoa. It is a popular region with tourists for its beautiful beaches, picturesque little towns, and food. Pastel-colored houses and flourishing gardens are a typical scenery along the coast. The climate of Liguria is generally mild, with warm summers and mild winters. The winters in Liguria are much less harsh and cold than nearby regions because the Alps and the Apennines protect the province from northern winds that bring cold air from Northern Europe. Though considerably milder than other areas of Northern Italy, it does sometimes get cold enough to snow in Liguria, with snow becoming more common as you reach higher elevations in the mountain regions. Bussana Vecchia: a 1,000 year old ghost town near San Remo (Province of Imperia) destroyed in the 19th century by a severe earthquake and now inhabited by artists, selling their handiwork to tourists, and organizing artistic events. See Bussana Vecchia and Ghost towns in Italy.